Like Kate who is now Catherine or the Duchess of Cambridge, this tiara seems to be getting a name makeover. The Scroll was purchased from Cartier by the Duke of York for his wife in 1936. Three weeks later he would become King George VI. 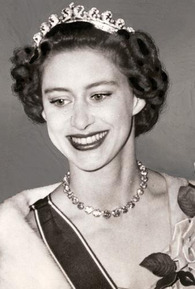 His wife, Elizabeth (who would eventually become the Queen Mother), gave it to her daughter, Princess Elizabeth (now the Queen) when the Princess turned 18, but there is no evidence she ever wore it. The Scroll was considered to be a "starter" tiara. 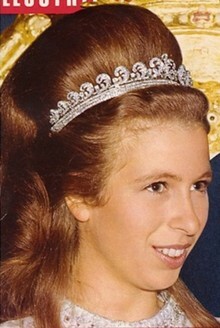 It fell to Princess Margaret who wore it quite often. Princess Anne also wore it quite a bit after Margaret upgraded.